Kinetic sculptor Anne Lilly’s “To Be” is on display at Brandeis University. Cubism set that poem jangling; in art, fractured bodies often point to existential distress. Works by the photographer Karin Rosenthal and kinetic sculptor Anne Lilly, in “Half-Silvered” at Brandeis University’s Kniznick Gallery, use reflective surfaces to break up the human form, but their mirroring environments offer unexpected and nuanced notions of wholeness. Lilly, best known for mechanistic sculptures with balletic grace (there are two here), has lately made bigger works with sliding mirrored panels. 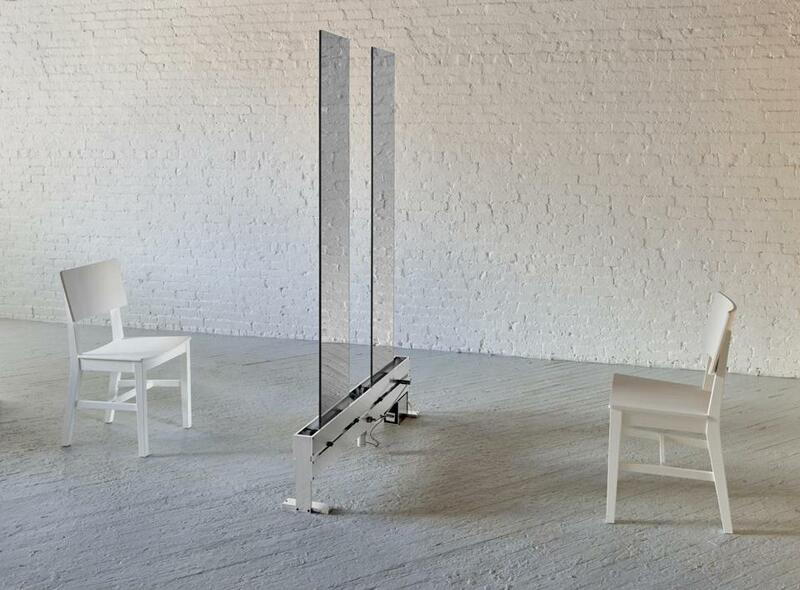 “To Be” features chairs set on opposite sides of a rail with mirrors that close and open. Sit, and your reflection gradually glides open to reveal someone else. The effect is disorienting and wondrous, a momentary letting go of self, followed by a reassuring reconstitution. Last summer, Lilly’s “Temple of Mnemon” on display on the Rose Kennedy Greenway, framed sliding mirrors against the sky. A viewer could recline on a bench below and watch herself vanish into the blue. Such works play with perceptions of the small, contained person that we see in the mirror each morning, buoying spirits with the marvels of a trompe l’oeil or a sleight of hand. More importantly, they intimate that we are larger than we think. For decades, Rosenthal has photographed nudes in the water and surrounding landscape. In “Cloud I,” a submerged body appears nebulous, arm and belly faded beneath the crisper reflection of the sky. It looks like a mountain-scape, with clouds scudding above the tree line, which is in fact shrubbery along the water’s edge. “Brilliant Day” shows two shoulders jutting at angles to each other from a placid pond, like smoothed river stones. The water captures their reflection beneath a bald stretch of driftwood. Weaving human elements into natural scenes, Rosenthal does away with the figure-ground hierarchy: People are not central, but one with the landscape. Like Lilly’s mirrors, Rosenthal’s reflections and immersions hint at a transcendental concept of self. Whitman, I think, would approve.